An outstanding alternative to dentures! After 27 years in private practice, this is the one procedure that has truly changed the lives of our patients and dramatically improved their quality of life. Denture wearers that have not been able to eat the foods they love, or smile with confidence in years can now, in one short dental visit, have their dentures firmly and securely attached in their mouth. The key to this process is the amazing strength yet incredibly small size of these MDI's (about the size of a toothpick). Patients can literally eat a meal with their securely fixed dentures the same day the MDI's are placed. The minimal healing time for this procedure is measured in hours or days as opposed to the months required for the older, traditional style implants. As an added bonus, the MDI's are less than half the cost of traditional implant systems. They truly are a "small wonder". • They can be immediately used to firmly secure loose dentures or to replace single or multiple missing teeth. • There is no delayed healing period waiting time. • Placement is accomplished in only one brief office visit. • The palate can be removed from the upper denture in most cases. • MDI's help preserve the remaining jawbone. • MDI's can be placed in areas where minimal residual jawbone exists. • They cost half the price of other implant systems. • Denture patients can eat and smile with confidence. Mini Dental Implants are half the cost of Traditional Implants! Are dental implants the best option for you? In most cases, dental implants are the preferred treatment to replace a single missing tooth, to replace several missing teeth, and to securely retain full dentures. ALL implants are made of grade 5 titanium. ALL implants are now some type of screw form. Anything under 3.0 mm in diameter is considered a mini implant. All above this diameter are considered traditional implants. Mini implants were developed to be used in areas where there was not sufficient bone width for a traditional implant, but there was sufficient height. To a great extent, bone resorbs more from the sides of the maxilla and mandible than it does from the top down. This makes minis an excellent implant choice. They are placed in areas where traditional implants, due to their width, cannot be placed. The use of minis avoids the extra surgeries and expense that would be necessary to graft bone and build the bone laterally enough to accommodate the traditional implants. If adequate bone exists, due to larger surface and thus more bone to implant contact, traditional implants are usually the first choice. 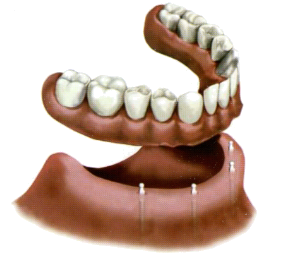 We use minis exclusively on denture patients to secure the dentures without invasive surgeries. Minis are placed directly through the tissue. There is no need for incisions or stiches. Healing time is much faster than traditional and minis are typically "loaded" or used immediately due to their screw/threadlike design. Atmosphere is so warm and staff are awesome! I was so thankful for the through approach to my teeth needs and was consulted about things that others had not taken the time to review. Honestly, going to the dentist is not something I look forward to, but Dr. Beckham and staff make it the best it can be.